It’s kind of late to actually go and bake a birthday cake, and since I have some refrigerated cookie dough on hand, these little treats shall be the birthday present. Guess where the recipe is from (no prizes though)? It is once again from one of my favourite cookbooks –500 Cookies ~The Only Cookie Compendium You’ll Ever Need~. 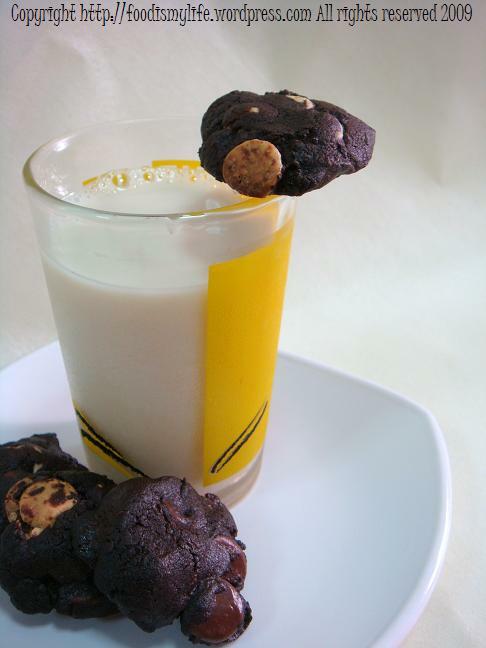 Most of my cookies that I have talked about in this blog are from the cookbook itself. What prompted me to make these cookies is when I first saw Ghirardelli chocolate baking chips on sale in the supermarket near my house. When I saw them, I know immediately I must get them. Ever since I used them in my two other recipes almost a year ago, I have not seen those fantastic chips shelved in supermarkets. What I absolutely love about these chocolate chips is that they remain gooey and melty, even after storing them for a few days. Seriously, after tasting such amazing chips, I have almost stopped using all other brands of chocolate chips. Most cheap-quality chocolate chips are unable to attain such cookie-licious-ness, so an alternative to Ghiradelli’s chocolate chips will be to chop up chocolate bars into pieces, which can be troublesome sometimes. Seriously, go get these chips. They are uber-licious in cookies. Preheat the oven to 160 degrees Celsius. Sift together the flour, cocoa powder, bicarbonate of soda, baking powder and salt. Set aside. Scoop the dough onto a baking sheet, leaving enough space for spreading. Bake for 12 to 14 minutes. Cool the cookies on a wire rack and store in an airtight container for five to seven days.